In the classic rom-com How to Lose a Guy in 10 days, the protagonist spends the entire movie trying to drive a new boyfriend away, even gifting him a ‘love fern’. While she was purposely trying to sabotage the new romance, many employers inadvertently damage a relationship with a new employee without even realizing it. When an employee joins a new company or starts a new role, they look at everything, wondering if they’ve made the right move. They scrutinize every part of their new environment – looking for signs they’ve made the right or wrong decision. Within the first 90 days, most employees decide whether to stay or go and if they go, all the resources spent finding, recruiting, and training them go right out with them. What can an employer do? Help them feel like they’ve made the right decision and make it easy for them to quickly feel like part of the team. These five tips will help! Before a new employee starts, send them a welcoming note and invite them to complete their onboarding documents via an intuitive, self-guided process on their device of choice. Give them all the information they’ll need to feel confident, such as a virtual tour of the office, guidance on the dress code, and an agenda for the first day. Develop a plan, work with your stakeholders, and make sure everything is set up for the new employee to have a productive first day. It’s amazing how different arriving to a desk prepared with equipment feels compared to a first day languishing in a windowless conference room filling out a stack of compliance paperwork. No one likes filling out government forms, and nothing will zap energy from a new employee quite like a first day packed with piles of paperwork. Simplify the process with a mobile-first onboarding experience where new employees can complete their compliance documentation. Include cascading data functionality so employees don’t have to keep retyping the same information. Give clear direction about the documents they need to bring with them, such as a passport. Handling compliance before an employee starts enables them to get cracking the first day and immediately feel like a productive team member. Remember the panicked look on the face of a new kid at school? Help your new employee avoid that fate by sharing all the information they need during the onboarding process. Let them know where to park, who to meet, and what to expect the first week. Proactively reach out and encourage them to ask questions. Information is power and providing it enables them to feel more confident about their position and decision to join the company. Everyone worries about fitting in and that fear can be overwhelming when starting a new job. Help your new employee create a strong social network by introducing them to people in the organization, linking them with a mentor, and taking them out for a team lunch on their first day. Connecting with colleagues is one of the biggest factors in an employee’s decision to stay or go. Have you ever been knee deep in work, wondering how you’ll ever get it all done? So, you hire a new employee. You don’t have time to properly onboard them, so they just get started working. You hope they do OK. Your employee leaves their first day in a daze and wonders why on earth they took the job. If this sounds familiar, you need a better onboarding solution, and since it’s 2019, it better be a super simple solution your new employee can access from their phone. Include company-specific forms and make sure it’s Soc 2 Type 2 and GDPR compliant. Automate as much as possible so your busy hiring managers have the time to provide a stellar experience and help integrate new employees into the team, instead of wasting time on inefficient and ineffective onboarding processes. Workable and Click Boarding partner to modernize the employee/ employer journey. Pair that with our own world-class, award winning, modern onboarding platform that excites HR and new hires by blending great employee engagement, new hire forms and onboarding tasks into a simple, flexible and compliant solution – and your business will have what it takes to be competitive in this job market. At this point, HR is keenly aware that onboarding is critically important, but fundamentally broken. 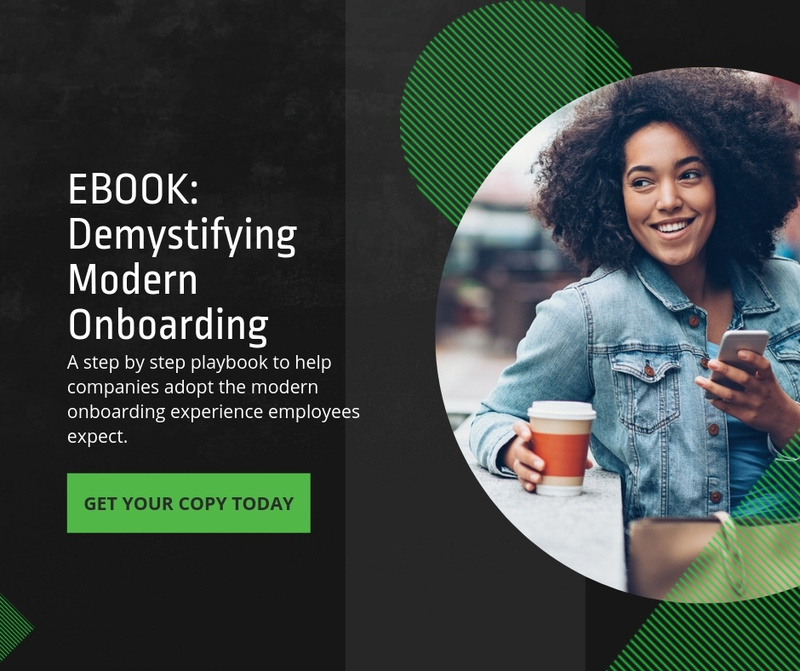 Unfortunately, rather than facing the issue head-on and making it an urgent task, a majority of organizations allow outdated onboarding to impede new hire progress and disengage otherwise enthusiastic employees. With culture and employee experience being a top organizational priority, you’d think that businesses today would want to invest time and energy in the number one key to retaining and engaging talent. A modern onboarding experience that provides smooth and comfortable transitions leads to greater employee engagement, better performance and self-confidence, and ultimately, higher retention. The answer is a modern, automated onboarding system that creates a smoother workflow, boosts engagement, improves employee and company performance, reduces risk and error, and saves HR dollars.